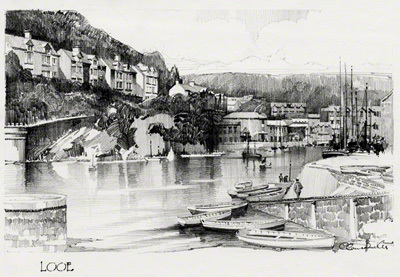 Claude Buckle's pencil drawing of Looe faithfully captures the town's harbour as it looked in the 30's. 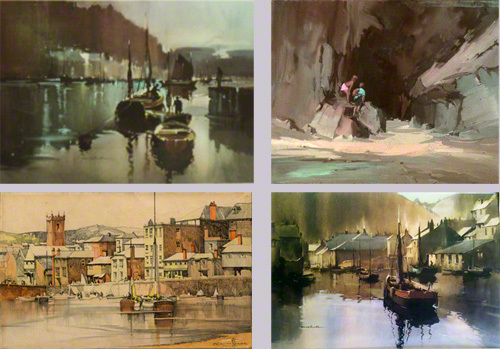 Claude Buckle painted a number of Cornish villages Looe, Polperro, st Ives, Mevagissy and Portscatho. Looe (Cornish: Logh, meaning deep water inlet) is a small coastal town and fishing port. The town is situated around a small harbour and along the steep-sided valley of the River Looe which flows between East and West Looe to the sea beside a sandy beach. Off shore to the west, opposite the stonier Hannafore beach, lies the picturesque St George's Island, commonly known as Looe Island. Created in 1933. Montage of Mevagissy, Portscatho, St Ives and Polperro.